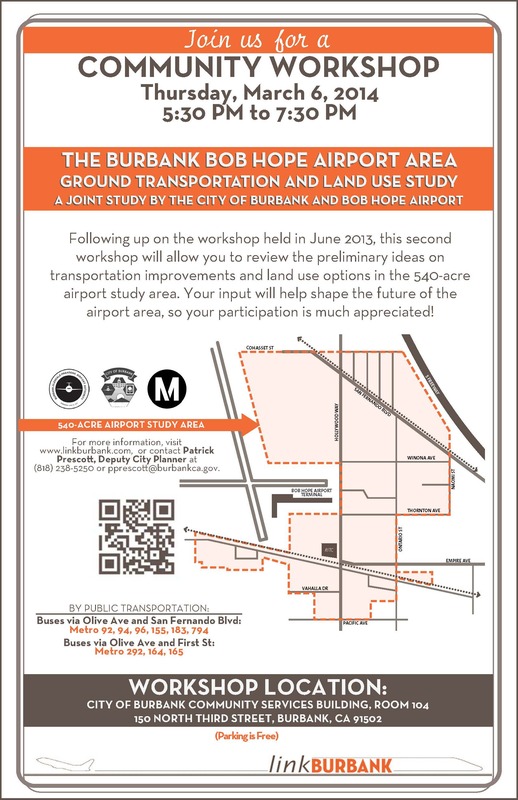 This is our final workshop of the 18-month planning effort that has looked at transportation and land use improvements in the Burbank Bob Hope Airport area. You will have an opportunity to review final alternatives, provide your feedback, and help shape the plan’s recommendations. Your input will help shape the future of the airport area, so your participation is much appreciated! For more information contact: Patrick Prescott at (818) 238-5250 or pprescott@burbankca.gov. 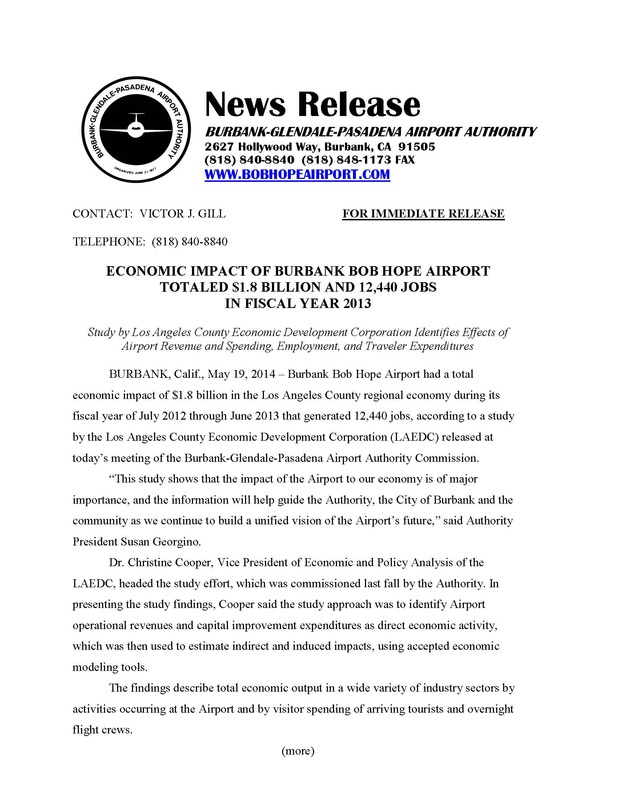 The Burbank Bob Hope Airport Area Ground Transportation and Land Use Study a Joint Study By The City of Burbank and Bob Hope Airport. Eco-Rapid Transit will be attending the San Fernando Valley Council of Governments (SFVCOG) Mobility Summit. This summit is scheduled to be held on Wednesday, March 5th 2014 from 9:00 am to 3:00 pm at the Burbank Marriott Hotel Convention Center – 2500 Hollywood Way, Burbank, CA 91505. Some of the purpose of this mobility is to meet industry leaders in government, community and business, interact with industry experts, and to see latest in alternate fuel and hybrids vehicles. 5 FWY (Along Eco Rapid Route) Busiest In Nation. Posted on August 21, 2013 by ECO-RAPID TRANSIT | Comments Off on 5 FWY (Along Eco Rapid Route) Busiest In Nation. The Department of Transportation has declared Interstate 5 as the busiest interstate in the nation. An article in the San Gabriel Valley Tribune (http://www.whittierdailynews.com/general-news/20130820/california-freeways-busiest-in-nation), reported that the second and third busiest interstates are the 10 and 110 freeways. Officials have called for additional road and transit funding to meet the growing transportation demands of the area. 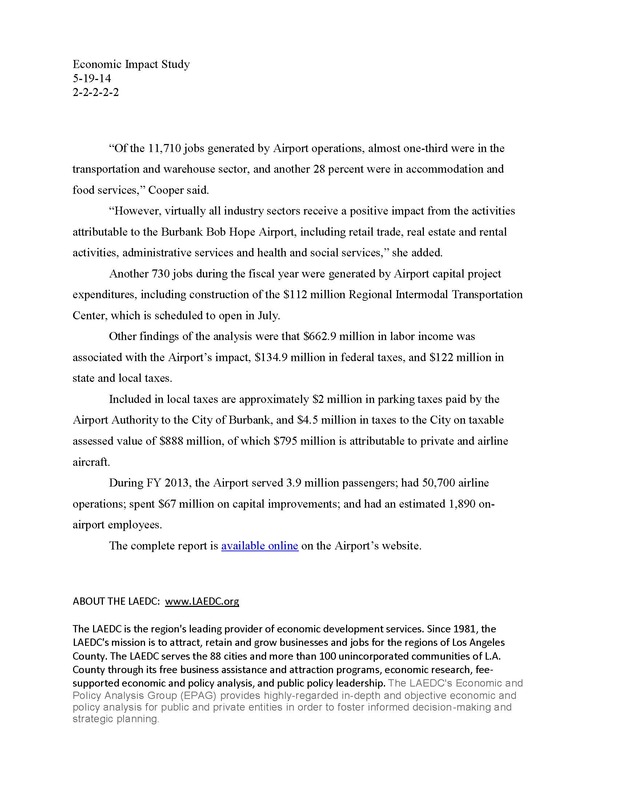 The article spotlights the astronomical number of miles traveled on local freeways by commuters and commercial vehicles, as well as the great need for additional funding for maintenance and improvement of existing infrastructure. Eco Rapid’s proposed route closely parallels the busy Interstate 5. The line will connect Cerritos to Downtown Los Angeles and will then link travelers to Santa Clarita. The project is one example of much needed improvement to our local transportation infrastructure that will alleviate traffic on the freeways and provide a viable, safe and practical alternative for commuters in the Interstate 5 corridor. Comments Off on 5 FWY (Along Eco Rapid Route) Busiest In Nation. Eco-Rapid Transit Board of Directors elected their new officers for the 2013-2014 year. Posted on July 23, 2013 by ECO-RAPID TRANSIT | Comments Off on Eco-Rapid Transit Board of Directors elected their new officers for the 2013-2014 year. Eco-Rapid Transit Board of Directors elected their new officers for the 2013-2014 year. Councilman Luis H. Marquez from the City of Downey was elected Chair. He is joined by Councilwoman Maria Davila, City of South Gate as Vice Chair and Vice-Mayor Rosa E. Perez City of Huntington Park as Secretary. Mayor Michael McCormick City of Vernon was reelected to the Treasurer post and Councilman Scott A. Larsen City of Bellflower was reelected to be the Board Auditor. Comments Off on Eco-Rapid Transit Board of Directors elected their new officers for the 2013-2014 year. 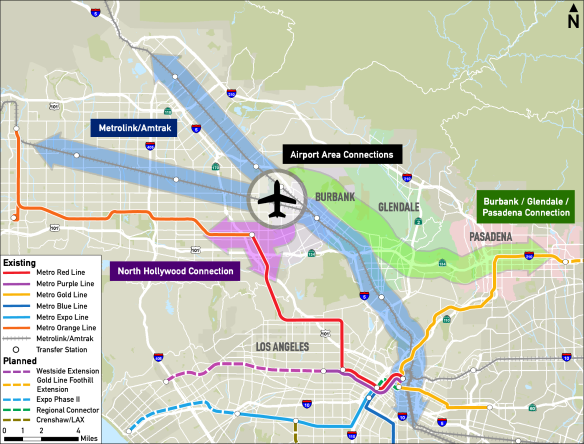 As you may have read last week, Metro and Metrolink held an event to celebrate a future platform on Metrolink’s Antelope Valley Line that will serve Bob Hope Airport in Burbank. 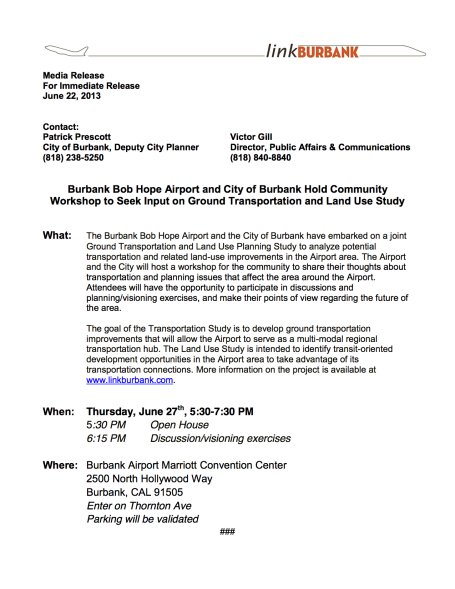 As it also happens, the Airport and the city of Burbank are in the process of a transportation and planning study to see how transportation and land-use may be improved on at the airport. There is a public workshop on Thursday — see details on the flier above for time and location. Below is a good map from the Airport and the city that shows where the Airport fits into the grand scheme of things transit-wise.